Home → Chemicals → Hillyard, Arsenal One, Citrus-Scrub #22, Dilution Control, HIL0082225, Four 2.5 liter bottles per case, sold as One 2.5 liter bottle. 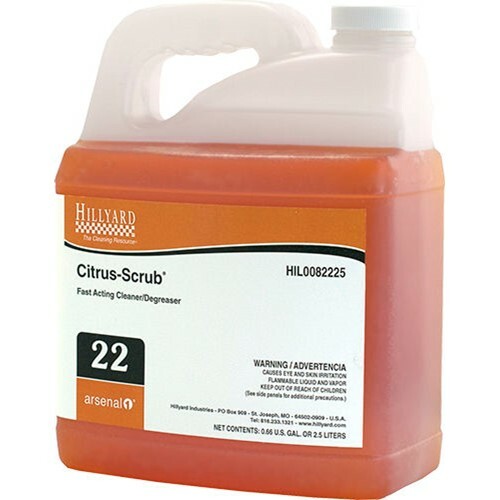 A fast-acting, cleaner/degreaser formulated with today's environment in mind, Citrus-Scrub does an excellent job of removing grease, oil, ink, fats, tar, adhesives, and other soils, yet contains no bleach, ammonia, phosphates, harsh acids, or alkalines. It's ideal for any washable, nonporous surface, and is especially recommended for degreasing equipment, motors, metal surfaces, concrete, and other hard floors. You can even use it on carpet (check label directions and always pretest first). Dilution rates 6 oz per gallon. Contains no bleach, ammonia, phosphates, harsh acids, or alkalines.